Who will look after my baby? NICU is made up of 8 rooms providing different levels of care to your baby. Intensive Care (ICU) – rooms 4 and 5 – for babies that are born prematurely or sick, needing ventilation or other critical support. High Dependency (HDU) – rooms 3, 6, 7 and 8 – for babies that do not require ICU but still require complex care. Special Care (SC) – rooms 1 and 2 – for babies that are just establishing feeds, growing and developing after needing complex care. The consultant neonatologists/paediatricians will lead on your baby’s care. Our specialist doctors are based in the Royal Manchester Children’s Hospital and care for babies on NICU that require surgery or other medical input. The junior medical staff support the consultants to care for your baby. Provides clinical leadership for the Unit and ensures effective management and support for medical staff. She is responsible for clinical effectiveness arrangements within the directorate and oversees matters of clinical policy and practice, staffing, education and training. She works in partnership with the Divisional Director and Lead Nurse to provide joint accountability for the quality and performance of the directorate, development of the directorate strategy and business developments. Works in conjunction with the Clinical Head of Division and Lead Nurse to ensure that the Unit meets all necessary activity and performance requirements. She manages all non clinical staff and is responsible for the operational efficiency of the Unit and effective use of all resources. Has responsibility for the overall day to day management of the unit and the wellbeing of the infants in our care, the parents and families, and the nursing staff. She provides professional and clinical leadership and works collaboratively with the lead nurses within the Greater Manchester area to support the delivery of excellent neonatal care wherever your baby is cared for. The Quality and Governance Matron – this role has responsibility for education, training, research, risk management, audit and quality. She is responsible for providing nurse leadership for the implementation of the Trust Quality Strategy, leading on risk management and the future development of clinical competencies and educational development. The Critical Care Matron – this role is the operational management of intensive care and high dependency care. She is a clinical expert and will ensure that appropriate nursing expertise is delivered to all neonates. She provides professional leadership to the Advanced Practitioners and oversees the development of enhanced and advanced practice. Continuing Care Matron – this role has responsibility for neonatal continuing care. This includes: low dependency care, transitional care (including advising on the care of neonates on the postnatal wards), community and outreach services, safeguarding and liaison with midwifery services internally and regionally. She provides a liaison role for families where birth is planned to take place in Saint Mary’s and in preparation for discharge or transfer. She is the safeguarding lead for the Newborn service. All help support and care for your baby day to day. A student nurse/midwife works to maintain and promote the health of infants while following the policies and procedures of Central Manchester University Hospital NHS Foundation Trust when gaining practical clinical experience. A student nurse/midwife must follow the instructions of her clinical mentor. Working at the Trust offers a chance for a student nurse/midwife to practice what she has learned in University. Students apply their knowledge and skills in the care of infants and their families under the guidance of a mentor and/or preceptor. The student’s behaviour should reflect the values and behaviours of Central Manchester University Hospitals NHS Foundation Trust at all times. Policies and guidelines for clinical placements must be adhered to and students must follow the values and behaviours of the Trust which are: Pride, Dignity, Empathy, Respect, Compassion and Consideration. The learning environment of the Neonatal Intensive Care Unit in which learners are placed is conducive to learning, in order to develop safe, competent, caring practitioners of the future. The students’ experiences will provide them with valuable learning opportunities. 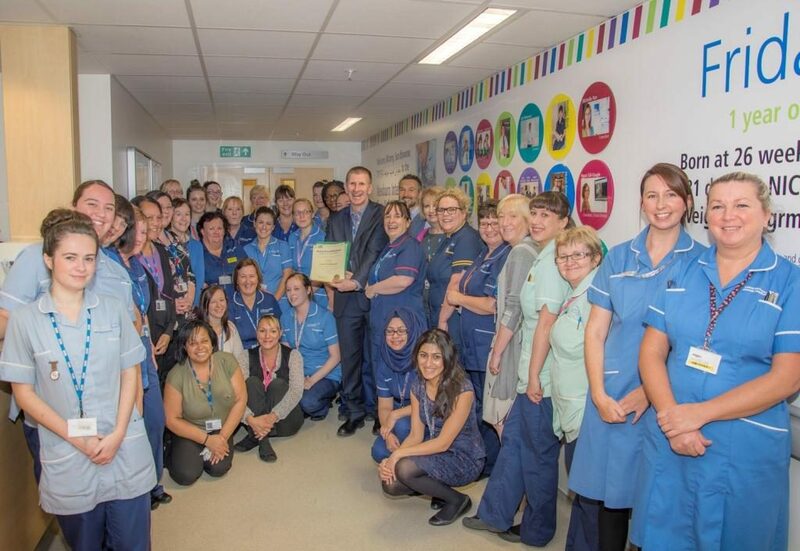 The physiotherapists who work on the Neonatal Intensive Care Unit (NICU) are based within Royal Manchester Children’s Hospital. They work as part of the Inter Disciplinary Team (IDT) to provide a service to the babies on NICU. This service provides early assessment to babies at risk of developmental problems; respiratory care as needed and assessment of any musculoskeletal or genetic conditions while the babies are on the unit. In many cases this consists of positioning advice and supporting parents and the IDT through the developmental care model and the concept of kangaroo care. Once your baby has been discharged from hospital any on-going Physiotherapy care will be provided by your local service; which may be a home visit or taking your baby to a local child development centre as they get bigger. Dietitians work as part of the multi-disciplinary team and provided assessment, treatment and monitoring. Their aim is to help maximise your baby’s nutritional needs, growth and development whilst minimising any complications that may be associated with diet. A neonatal pharmacist has extra training to work with premature and or sick babies. The neonatal pharmacist works alongside doctors and the nurses on the unit to ensure that the medications prescribed to your baby are safe and effective. They can provide information to you and to your family about the medications that your baby is prescribed and help ensure that on discharge you are confident and able to administer these medicines. On a daily basis a pharmacist will review your baby’s drug charts and order any PN (parenteral nutrition) that they require. Parenteral nutrition comprises many components and it is imperative that it is made to meet your baby’s requirements in a sterile pharmacy environment. The pharmacist will also provide information to you and to the doctors looking after your baby about the safety of breastfeeding whilst taking any medications. Please feel free to stop the pharmacist on the ward if you have any medication related questions they can help with. Provide diagnostic imaging services as required. The Lead Specialist Speech & Language Therapist works alongside the feeding team including nurses, Dietitian and Physiotherapist with a specific role to assess and manage early feeding and swallowing difficulties including the prevention of aversive feeding patterns. She also provides teaching to all staff on the unit on feeding and swallowing, promoting oral readiness and the management of complex feeding and swallowing difficulties. Our Infant Feeding Team is based on the NICU and work with the nurses and doctors to provide extra support to parents with all aspects of feeding during your baby’s stay. Our team members have a variety of experience ranging from Nursery Nurses to Enhanced Nurse Practitioners and all have a special interest in feeding. We work closely with the Speech & Language Therapist and Dietitian to support you and your baby’s stay on the NICU. Expressing milk – Breast milk is highly beneficial for preterm and poorly babies. Your NICU nurse will support you to provide breast milk for your baby by showing you how to hand express in the first few days to gain colostrum (mum’s first milk). It is quite common for a mum’s milk supply to change during her baby’s time in hospital and our Feeding Team can offer extra tips and advice to support you. Breastfeeding and bottle feeding – NICU nurses are trained to help support you and your little one’s feeding journey. The Feeding Team are on hand to offer extra advice and support to help you feel confident in feeding your baby. Feeding drop in – In our parents’ sitting room every Wednesday, it’s a great chance to meet other parents, share experiences and top tips, plus get to speak with one of our Feeding Team for further support and advice. Take a look at the leaflets under the Feeding Section on this website for useful information. The Manchester Neonatal Outreach team (MNORT) was set up in 1945 to address the increasing infant mortality rates in central Manchester, which at the time were below the national average. Currently, the infant mortality rates compare favourably with the national average. The MNORT consists of a highly specialised team of midwives, neonatal nurses and nursery nurses. All members of the team have experience in working in Neonatal Intensive Care Units (NICU) before transferring into the community. We are a citywide service. The team accepts referrals from Saint Mary’s, Wythenshawe and North Manchester NICUs. We also receive referrals from the postnatal wards from the aforementioned hospitals. Babies from the postnatal wards are generally babies that are born mildly preterm with a gestation of 35 weeks or have a birth weight of 2.2kg or below. The majority of babies we visit at home are preterm. A significant number of these preterm infants, although generally healthy, may still require oxygen support until there is significant lung growth and they can be weaned off the oxygen. Having an experienced community service allows for earlier discharge from hospital which benefits both baby and their parents. The ROP team run weekly clinics to assist screening and treatment for ROP (Retinopathy of Prematurity). Our counsellor provides free confidential support to parents of babies on NICU. Everyone that works on our unit is very friendly and very professional, please do not worry about speaking to anyone about your worries and fears whilst being on the NICU.